When your dog digs there is usually some underlying reason. Consider that dogs dig naturally to reveal his prey or is used to bury his food to use later. Dogs might dig to build an underground shelter of sorts as a windbreak or to keep warm. When it is warmer, a small hole may keep your dog a bit cooler. 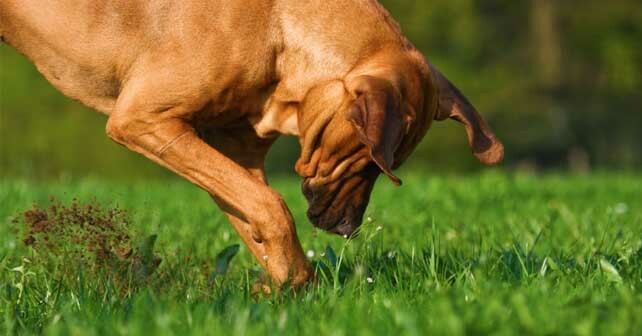 Some dogs might even dig before they urinate or defecate. Many dogs, even indoors, simulate digging when they find a place to rest. This type of digging behaviour does not usually cause immediate damage, but it could wear down your carpet over time. Generally speaking then, digging does not cause much of a problem until it destroys property. In order to try and prevent the digging behaviour, you should first try to prevent the opportunity for digging and find an alternative activity, one that your dog finds physically challenging and fun. A dog that buries treats or food can encourage all manner of wildlife to bother your garden and can lead to further problems. Raccoons, Foxes and Rats can all become a problem if food is left outside and sometimes the scent of your dog is not enough to deter them. Generally speaking it is probably best that your dog not be left alone and unsupervised for a great length of time in the yard. Your dog should be less likely to waste time and energy digging holes if you walk him regularly or provide productive physical activities or training time. Make sure to have daily play sessions that apply basic dog obedience skills. Don’t offer your dog a treat if he has access to outside. Make sure if you give your dog a treat, he has finished it, or you locate it and pick it up before you let him out. This will prevent him from being able to store food outside. If you give your dog a treat, make sure he has no access through open doors etc. Make sure your dog has finished eating before letting him out. Dogs will often ask to go outside to pee or defecate a little while after eating. Before you let them out, make sure they have finished eating so they can’t ferry food to bury it outside. Check your dog’s mouth before letting him outside. A quick scan of your dogs mouth, even from a distance will enable you to see if he has an object he wants to take outside with him. Remove them from him before you let him out to reduce the chance of him burying it hiding it.